Edutopia PBL - Edutopia is a site containing outstanding educational content for teachers. It contains an area devoted to Project Based Learning. Edutopia defines PBL, "as a dynamic approach to teaching in which students explore real-world problems and challenges, simultaneously developing cross-curriculum skills while working in small collaborative groups." The site contains a brief article, along with videos entitled "Projecty Based Learning Overview" and An Introduction To Project Based Learning. The Edutopiamain PBL web page contains real life examples and this Big List containing article and blogs relating to PBL activities, lessons, practices, and research. Upon review you will note that Edutopia does live up to its statement "What works in public Education". PBL-Online Is a one stop solution for Project Based Learning! You'll find all the resources you ne?ed to design and manage high quality projects for middle and high school students. This site includes information on how to Design your Project. It assists teachers in planning rigorous and relevant standards-focused projects that engage students in authentic learning activities, teach 21st century skills, and demand demonstration of mastery. It also provides a search for projects developed by others (small collection) or the ability to contribute projects to the PBL-Online Collaboratory and Project Library. Teachers can Learn what defines Project Based Learning and the PBL-Online approach to successful project design. There is also an area to Review research and find tools to support effective Project Based Learning. There is also an area to purchase the BIE //Project Based Learning Handbook// andStarter Kit which are a foundation for the PBL-Online website. A nicecollection of videos is also available on the site. The PBL-Online is maintained by the Buck Institute for Education (BIE) which is a non-profit, research and development organization dedicated to improving the practice of teaching and the process of learning. BIE Institite For PBL - The main Buck Institute of On-line Resource Site is a must visit for anyone serious about PBL. There is some good information on the professional development . Explore the BIE Project Based learning Handbook, order a copy, or just explore the links on the page. Be sure to check out the downloadable documents and forms found in the book. There is also a web resources link page that will supply abundant information. There is an excellent forum page that and another area with Advice From Teachers.This is truely a great site to become more informed on Project Based Learning and works well with other other BIE site. PBL: Exemplary Projects - A wonderful site for those wanting practical ideas to infuse PBL into the curriculum. This is the creation of a group of experienced teachers, educators, and researchers whom you may contact as resources. This team includes people who are also actively doing and creating new exemplary PBL projects, pre-service and continuing teacher professional development, and integration of technology into the curriculum. This site has a great listing of national technology and content standards to review. There is also a large selection of rubrics to look over as you investigate assessment. For those interested in research be sure to check out the page reserved for reflective thought and planning. While on the site be sure to take a look at theexemplary projects along with the other great projects listed. 4Teachers.org PBL - This site has a contains some useful information on supplying sound reasoning for PBL in school. Especially interesting are articles on Building Motivation and Using Multiple Intellegences. One very useful resource in this site is the PBL Project Check List Section. Writers of this site maintain that these check lists will help teachers start using PBL, by creating on-line downloadable age-appropriate, customizable project checklists for written reports, multimedia projects, oral presentations, and science projects. The use of checklists assists in keeping students on track and allows them to take responsibility for their own learning through peer- and self-evaluation. Be sure to check the main 4Teachers Web Site for all of their great sets of tools including other resources that can support PBL. This site is published by Altec which also has a host of resources. Houghton Mifflin Project Based Learning Space - This site from publisher Houghton Mifflin Contains contains some good resources for investigating PBL and was developed by the Wisconson Center For Education Research. Included is a page on Background Knowledge an Theory. There is also a link to a small number of comprehensive projects. 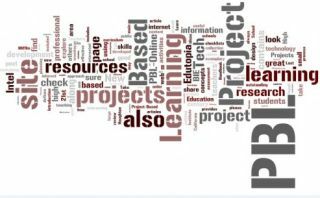 Last for those attempting research there is a large numbers of professional articles related to project based learning. Intel® Teach Elements: Project-Based Approaches - If you are looking for free, just-in-time professional development that you can experience now, anytime, or anywhere, this may be your answer. Intel promises that this new series will provide high interest, visually compelling short courses that facilitate deep exploration of 21st century learning concepts using and PBL. The program consists of animated tutorials and audio dialogs to explain concepts, Interactive knowledge checking exercises , offline activities to apply concepts. You can take the PBL course online, or order the Intel PBL CD, Take a moment and read more about project design. Intel provides an awesome data base of stories that relate to project ideas. Anyone interested in project based learning must explore the Intel site, one of the most up-to-date resources for PBL on the internet. New Tech Network - I have personally visited the New Tech Schools in both Napa and Sacramento California. I was impresssed with more then the technology. A positive and effective culture for learning is what New Tech does best and it is based around PBL. Take a look at the news releases on the New Tech site. Some that caaught my interest were Wall-to-Wall Project-Based Learning: A Conversation with Biology TeacherKelley Yonce » from Learn NC, The Power of Project Learning » from Scholastic, and Students as Smart Mobs along with It's All about me both from Phi Delta Kappa. Last check out the New Tech video entitled NTN School Overview and I Am What I Learn for a good informative look at PBL and New Tech. High Tech High School - These high schools also operate using a project based learning model centered around 21st century skills. I have included projects they came up with from a $250,000 California grant to institue PBL in non-charter public schools. You will find a description of the project along with the seven major projects and various others. The included PBL assessment page is also very interesting along with how PBl supports literacy in the High Tech Model. GlobalSchoolhouse.net - Great site to begin PBL using the web while cooperating with other schools. Harness the ability to use the web as a tool for interaction, collaboration, distance education, cultural understanding and cooperative research -- with peers around the globe. Start out with an explanation of what Net PBL really is. Find out how to make partners. Be sure to check out all the videos and tutorials.